Are bonds worth a re-think? 2014 has turned out to be good for bonds. On the surface this is surprising, particularly after 2013 was marked by the first few sell offs of bonds of this cycle. We have believed in tapering and eventual interest rate rises (ie bond price declines) for quite a while and in late 2013 we were proven right. So are we wrong now? The argument for a negative view on bonds has softened in recent weeks and it is worth trying to understand if this is a temporary loss of confidence, or something that might last for the rest of 2014. Will 2014 break the bond market, or see another good year? Determining whether equities are fully valued or not is a parlour game that played by everyone from the average investor to billion dollar managing pension and hedge funds, but let’s have a swing here. On some measures the market is very fully valued and on others it seems reasonable. 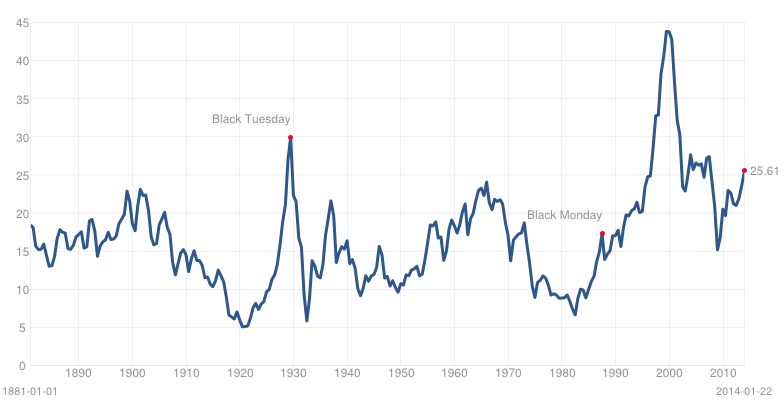 The Shiller PE (an average of profits over 10 years to current price) is showing it is pretty overvalued right now. 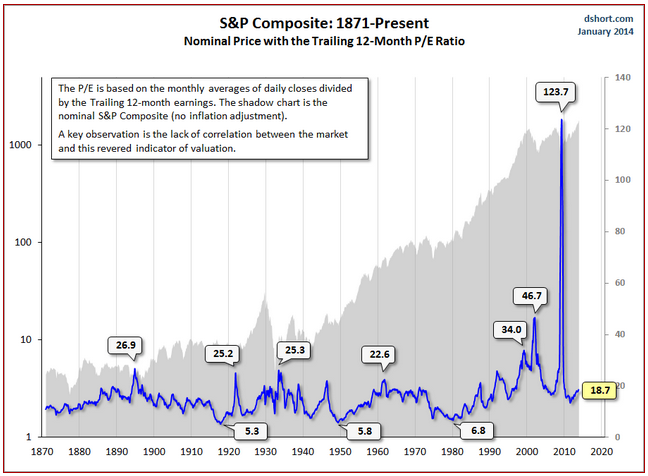 In fact the market is now easily in the top 10% of valuations of the markets 100 year odd history. That’s something to ponder. There are other ways to value the market and an excellent comparison of various measures can be found here. It also shows the market wide S&P 500 PE for last year’s trailing earnings is 18, which isn’t much above the long-term average of 15.5 (or so). Still, it’s not below. It’s quite possibly on the high side. Are earnings really going to increase rapidly to justify their valuation? It seems hard to forecast given profits are already close to a record as a percentage of GDP and also when you consider the fact the recovery is still pretty tepid. It seems clear that the recovery is underway. It also seems clear that the recovery is weak and looks likely to disappoint for a good year or two yet. Unemployment is improving, but much of that is through lower workforce participation. People giving up on work isn’t really good news. Europe continues to bounce around barely above a recession. Japan is doing its bit for growth and China continues to grow but at a slower pace. Still after downgrading growth prospects last year the World Bank has upgraded it’s forecast for this year, but not by much. It really shouldn’t be surprising. The most useful research on the crisis and its aftermath is that a financial crisis due to excessive leverage throughout an economic system is quite often very deep and the deleveraging process can last a long time. Up to a decade in fact. Exhibit A here is Japan and it’s two lost decades. Exhibit B is the Great Depression. In that context one highly regarded hedge fund Ray Dalio renowned for his independent thinking described the US recovery as a “beautiful deleveraging”. Inflation is low just about everywhere. Not India and Brazil of course, but developed countries are closer to deflation in some cases than they are to their inflation targets. Low inflation gives scope for more easing of monetary policy which can include interest rate cuts. In fact the ECB took that opportunity late last year to drop interest rates to just 0.25%. With inflation still on the floor, and growth pretty tepid, interest rates could stay down for a while, making bonds more attractive at least for a while yet. Now we aren’t suggesting investing in Bonds is without risk this year. Here are some counter arguments. Every year the recovery continues, and yes, we are in a recovery still (tepid though it is), then the closer it comes to higher interest rates. When that will be, is anyone’s guess, but everyone in the market knows this will occur. Also, no-one wants to be the one still standing holding bonds when the low interest music stops. So although bonds seem OK today, you are investing potentially on the side of a cliff. Or at least a steep embankment. The unexpected interest rate rises in 1994 lead to a pretty steep sell off of bonds and this fact is well known and discussed in the bond markets these days. A major arguments for bonds is a fall, or at least stagnation in equity markets. The PE ratio quoted above and more widely in the media is for either the US S&P 500 or for another US market index. The world’s financial media has a heavy US bias. There is however a big wide world out there and many other markets are much more fairly valued. Countries like China and Russia in particular are much cheaper with PE ratios in the single digits and several countries in Europe in the 10-12 range (ie still on the cheap side). Emerging markets in general had a pretty terrible 2013 so relative value is around in many places. Bonds aren’t the only place to go. Even property looks like a reasonable bet with low interest rates, rising demand due to increasing employment. Probably the best reason for avoiding bonds at this precise moment is that you have already seen bond prices rise, the inverse of falling interest rates. For example US treasury yields for 10 year bonds have fallen from 3.01% to 2.88%. British government bonds called gilts have fallen from 3.03% to 2.86%, and German government bonds called “bunds” (no nothing to do with Shanghai’s Bund) has from its already low 1.94% to 1.83%. These falls don’t seem like much, but in the bond world that is a pretty big movement in a short time. It might go further. When putting all the thoughts on the tepid recovery, equity valuations and combining them with the view that new Federal Reserve Chair Janet Yellen is a dove supportive easy money, then we get the following strategy. We think that the bond sell-off is still in the distance, perhaps late this year or next. Much depends on the economy. We also believe however that market will remain nervous and the market might yoyo a few times this year. So pick your entry prices and buy at the better interest rates or wait until they bounce back. Today’s prices aren’t so interesting, but chances are you’ll get another chance at a better rate pretty soon.